I've said before that while interviewing 'big name' mathematicians or authors is always a thrill, probably the most fun I have is learning more about the everyday sorts of folks who do math blogs, but whom I know little about. Such is the case in interviewing Dr. Mike Lawler and finding out much more about the fellow who has, with two able assistants, been entertaining many of us for awhile now in short family videos with a wall and a magic marker. 1) Mike, I don't actually follow a lot of the primary/secondary education-related blogs that closely, since I'm not active in that area, but I have followed your blog somewhat for the last year. For my own benefit, and any others who don't know, tell us a little about the history and evolution of your blog… why/when did you start it, have your two "assistants" always been a part of it, how has it changed over the time you've been doing it, etc.? The blog is relatively new – I think the first post was just last fall. I decided to start writing because several teachers that I follow on Twitter wrote “a day in the life” articles and I thought it would be fun to contribute something. I signed up for a Wordpress account and wrote about one of my days. After that I started writing about some of the little math projects that we do. It was about 4 years ago, though, that I started putting some of the math work that I do with my kids online. The math video projects started as an offshoot of some coaching that I do (see question 8). There were lots of internet resources with adults talking about math and I thought kids and parents might find it interesting to see other kids doing math. It was just a whim, really, but we’ve now got close to 1,800 videos up – with no organization at all, sadly. Ha. Other than trying to keep the video times to less than 5 minutes these days, I’m not sure they’ve changed that much over time. For the stuff we do during the week, we just sit down and talk through a problem or a concept. Some of our weekend activities are a little longer, but I try to break them up into shorter pieces to write about on the blog. 2) Are your boys already thinking of being mathematicians when they grow up, or is it too early for such decisions? Do they get kidded much... or saluted... by peers and schoolmates for their internet 'stardom'? Ha – no, there is no desire for internet stardom. That’s definitely not the point at all. The kids are too young to be thinking about careers. If you asked them now about their dream job, it would probably involve some combination of Minecraft and Lego. But they both have always loved numbers and math. For example, when my oldest was in preschool, each kid was assigned a letter for show and tell. He got “q” and decided to bring in a poster with the number one quintillion written on it. I’m just trying to keep them interested and to show them some fun and unusual things that wouldn’t normally be part of a school math curriculum. 3) I understand you were long ago a professor (math?) at a university… can you say much about why you left that career? And to my surprise, you currently work in the insurance industry (I'd simply assumed you were a teacher)… how does mathematics play into your current career, and along with that perhaps you can say something about the well-publicized, recent billion-dollar prize Berkshire Hathaway offered for a 'perfect bracket' in (basketball) March Madness -- apparently YOU had a hand in that? I finished my PhD in math at Brandeis University in 1997 and took an assistant professor position at the University of Minnesota for two years. For reasons that I’ve never really been able to understand, I sort of lost interest in math in graduate school. I accepted the position expecting that I would be leaving academia pretty quickly, but because I’d basically spent my entire life up to that point wanting to be a math professor, I figured that I’d regret it if I didn’t at least give it a try. Although I enjoyed the two years in Minnesota, I really had lost interest in academic math. My wife and I moved to Omaha (where I grew up) in 1999 and by an amazing bit of luck I was hired into Berkshire Hathaway’s reinsurance division in late 2000. I’ve worked there ever since. Most of the math I studied was theoretical, and obviously there’s none of that in the work that I do now. There is a lot of problem solving, though, and I enjoy that part of my job tremendously. I was part of the team that worked on the perfect bracket deal, which was truly one of the most interesting problems in statistics that I’ve ever seen. It was particularly amazing to see all the different opinions that were offered about the odds of a perfect bracket. When small changes in assumptions are essentially being raised to the 63rd power, you get a pretty wide range of possible answers! I’ve also been lucky to have been involved in a few other really fun projects. In 2003 and 2004 we partnered with Pepsi on a TV game show called “Play for a Billion.” On that show there was a 1 in 1000 chance that one of the contestants would win a billion dollars. As in the Quicken perfect bracket deal, we wrote an insurance policy to Pepsi that would pay the prize if someone won. I helped pick the winning number on the show both years, which was quite an experience. On another promotion that we insured in Europe, I served as the dealer in a TV poker game where there was a EUR 100,000,000 prize if one of the players ever ended up with a royal flush in spades. The lesson from these projects is that TV show production is pretty different from the normal day to day life of someone involved in math! 4) Of the videos you've done with your boys, which was the hardest one to complete? And do you have to 'rehearse' much for these clips, or do multiple 'takes,' or do you usually pull them off in one take? The prep work for the Graham’s number project is pretty unusual, frankly. For virtually every video we do I do no prep work at all. It is often the case that the problem we are talking through is something that we’ve already been covering in the books they are studying, but there’s no rehearsal or multiple takes or anything like that. The boys only see the problem we'll be talking about right before the camera is turned on. I want kids watching these videos to see other kids thinking and doing math, and “doing math” for kids and adults involves a lot of mistakes and false starts. Our videos are filled with those. I should also point out that I am no expert at teaching math to kids – there are many mistakes and false starts in my own teaching that are on full display. No one is going to watch our videos and come away thinking – wow, that guy is super polished. I’ve only re-shot a complete video once, and that was because instead of publishing it, I wasn’t paying attention and geniusly deleted it! Oops. Occasionally I’ll start over if something has gone totally off track, but that’s actually very rare – I think it is important for the mistakes and the struggles to be part of these videos. 5) What have been a couple of your favorite videos to do, and which have seemed to be favorites with your readers? I think the video that has been the most popular is this one about why a negative number times a negative number is a positive number. That one came about last summer when Dan Meyer asked on Twitter if there were any interesting explanations of this fact. I was sort of daydreaming at work and thought the idea of inclusion/exclusion might be interesting for kids to see. It has 1200 views or so – that’s probably as close as any of our videos are going to get to cat video-like view numbers on YouTube. The second is a calculation of the speed at which the Sun is moving around the center of the Milky Way. This one is from two years ago and my older son and I were just playing around with estimation and arithmetic with large numbers. We found a bunch of fun examples from the solar system and the Milky Way and this was the last one in the series. As I said above, we don’t really do any prep work, so it was a cool surprise to see his old favorite number come up in this video – one quintillion! 6) From your time spent doing the blog videos are there any behind-the-scenes stories that might be funny or entertaining to tell? I’m not sure that I’ll have the best collection of funny stories, but there always some funny things that the kids will say. We were talking about the Collatz conjecture, for example, and I explained that the process always seems to end up at 1 for any number anyone has ever checked. I told them that we’d be famous if we checked a number that no one had ever checked and found out that it didn’t eventually end up at one. At that point my younger son suggested that we try the number 23. A story from the Minnesota days may be the most entertaining and also helps to show why I enjoy doing all of these fun little projects with the kids. A friend of mine was a middle school teacher at the time and she invited me to the school’s career day. I forget the details, but the general idea was to have maybe 5 people come in and spend a class period with a group of kids explaining a little about what you do in your job. Groups of kids would cycle through the 5 career stations over the course of the day. The project I chose to illustrate stuff that math professors think about was the Monty Hall problem. I had the kids pair up in groups of two and play the game with cups and pennies. Before we started the kids had to try to guess the outcome for the switching and non-switching strategies, and, as there always is with the Monty Hall problem, there was lots of spirited debate. Unlike most conversations with adults involving the Monty Hall problem, though, everyone seemed to have fun. The neat surprise came later in the week when I saw my friend again and she told me that, to her absolute shock, the kids voted the math section as their favorite section from career day. She really couldn’t believe it, and she said that all the teachers at the school were just baffled as to how that could have been the case. Her shock has always stuck with me, and I hope to show kids that math can really be fun. Certainly one other important story is all of the great math stuff that people are sharing on their blogs and on Twitter these days. Teachers like Fawn Nguyen and Patrick Honner have been particularly influential in helping me think about what to teach and how to teach. Even more so in the last year after my high school math teacher and mentor, Mr. Waterman, died from ALS. Alexander Bogomolny's Cut the Knot website is an absolutely amazing resource that I find myself returning to again and again. Many people in university math departments are also sharing great stuff that I've used with my kids -- people like Evelyn Lamb, Steven Strogatz, Ed Frenkel, and Laura Taalman are just some of the people I would suggest that everyone follow (you have to see Taalman's 3D printing blog to believe it). Finally, Richard Rusczyk is doing things at Art of Problem Solving that I can only describe as being beyond anything that I could have possibly imagined could be done in terms of presenting fun and amazing math to kids. Ha – the picture is from high school. Just a picture that I like – nothing of any significance. I think it is from the spring of 1988. My hair is shorter and I weigh a bit more now! No relation that I know of to Greg Lawler. My parents were both Theology professors at Creighton in Omaha, so there is a little bit of academia in the family, just not math. 8) To round yourself out a bit, when you're not doing mathy things, what are some of your main interests/hobbies/activities? Outside of work and teaching the boys, my main interest is coaching ultimate frisbee. I’ve spent the last 6 years working with the Boston women’s club team Brute Squad and the Seattle women’s club team Riot. After spending the last two seasons with Riot, I’m back with Brute Squad this year. The first tryouts actually begin this weekend. I played a lot when I was younger and even met my wife playing ultimate. I’m happy to have the chance to still be involved in the game. I’m not sure what the general public would view as a more unusual way to spend your spare time – making math videos for kids, or coaching ultimate frisbee – but they are both really important and incredibly satisfying activities for me. I find the amount of work and dedication that the players put in to improve over the course of the season to be a constant source of inspiration. The leaders on these teams – like Gwen Ambler and Rohre Titcomb in Seattle and Blake Spitz and Emily Baecher in Boston – are among the most impressive people I’ve ever had the opportunity to work with in any setting. Thanks Mike! Neat to learn so much more about the dude-in-the-ball-cap behind all those math videos. Keep teaching those young men... and keep letting us peek in on the lessons along the way! If by any chance you're not familiar with Mike's work on the Web, click on a few of the blog links he's provided and you might just get hooked. 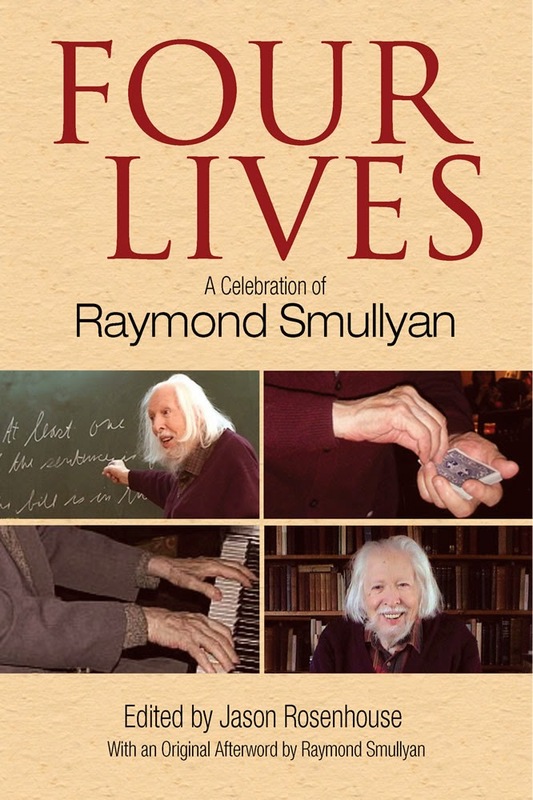 15) If you missed my thumbs-up review of Jason Rosenhouse's "Four Lives: A Celebration of Raymond Smullyan," it's the post just prior to the one you're reading. The very last line of the piece: “'The majority of people who watch Bob Ross have no interest in painting,' she said. 'Mostly it’s his calming voice.' "
If you're a Raymond Smullyan fan, go get Jason Rosenhouse's new volume, "Four Lives: A Celebration of Raymond Smullyan," NOW! And if you're not familiar with Smullyan, but do enjoy logic, puzzles, and math, the same advice goes. I was thrilled to see a tribute to Smullyan come out while he is still among us (his 95th birthday is next month), and to learn more about Dr. Smullyan than I already knew -- EVERYthing I read here raised his pedestal even higher than I already beheld it previously! Though Rosenhouse is editor (not author) of this volume, his love for Smullyan shines through, as well. Smullyan is an accomplished logician, musician, magician, and mathematician/philosopher (I believe those are the "Four lives" referred to in the title? ), who, in his 90s still flirts with all these subjects… oh, and, with the ladies as well, I might add. I consistently find Rosenhouse, by the way, to be one of the best popular math expositors around today (though I don't always agree with some of his more philosophical writings), and this tribute volume is another job well-done. The Introduction to the book, by the way, is Rosenhouse's own story of how he came to know Raymond, and how he ended up as editor for this volume. Part 2 of the book ("Mathematics and Logic") is probably the driest, toughest section (depending on your background/interest in formal logic), with four contributors (including Douglas Hofstadter) dealing with mathematical logic. There is a rambly, fun "Afterword" to this section written by Smullyan himself, in his typical playful (and punful) style. Part 3 is a wide-ranging sampler of Smullyan's writing, beginning with a heavy dose of Raymond's bread-and-butter knight/knave (truthteller/liar) puzzles. Also included is one of my very favorite puzzles, the "two envelope" paradox, even though it didn't originate with Smullyan. Toward the end comes a section from Raymond's "The Tao Is Silent" volume, another favorite of mine (on Taoism). And I was happy to learn from this volume that he actually wrote a couple of other spiritual-oriented volumes of which I was unaware. On a separate note, the listed bibliography also includes three "personal/autobiographical" works which I'll have to now look for. Like Martin Gardner's autobiography, this book will appeal primarily to those who are already enamored of its subject, but hopefully, along the way, it will also pull a few additional folks into the corral of Smullyan fandom. I'm not sure I envy Dr. Rosenhouse's task here of capturing Raymond Smullyan in 300 pages (akin, I would say, to catching lightning in a bottle! ), but he has done an admirable job of it. My sole regret is that there is not more on Smullyan's childhood/youth in it. When someone is as multi-talented, interesting, engaging, and well-loved as Raymond Smullyan, a reader wants to know more about the background that made this individual the person they became. But there's little insight here into Raymond's childhood/family life, formative teen years, or college years. I suppose we'll have to wait for an official biography to come along for that. It's always difficult for me to think of Martin Gardner without thinking of Dr. Smullyan in tandem, so similar are these two brilliant and humble giants in many regards. Raymond's name, appearance, subject matter, and writing style are all just a tad odder or less smooth than Martin Gardner's, and so he has always seemed slightly off to the edge of Gardner's front-and-center stage appearance and facile way with words [somewhat odd too, given that Gardner was probably the shyer, more reticent/introverted of the two]. For now, Smullyan has a bit of an academic cult-like following, but when he is no longer with us, I suspect his legacy will, like Gardner's and also that of Richard Feynman, broaden out to an even wider audience. And deservedly so! I'm thankful for Dr. Rosenhouse's contribution toward that end. "…Smullyan's achievement seems to me quite unique. Not only has he made original contributions and advances to mathematical logic, and has expounded elements of the subject in a way that reveals them more clearly, strikingly, and economically; but also he has drawn people at all stages of education to an appreciation of some level of his subject. He manages to involve both the student and the serious academic, the young and the old, the passer-by and the dilettante in mathematical logic. He does this in a rounded way, with a charm and ease which makes it seem like legerdemain." Indeed, he does… and, I say that, as a knight! 2) Long, interesting 1999 piece from Alfie Kohn (pointed out by "Matthew Maddux" this week) arguing for the "constructivist" approach to teaching mathematics. The debate over what content to teach in math and how to teach it seems to go on forever (as did the first draft of this post!)…. It's a long (but entertaining) read so I'd wait and come back to it at the end, but I do think it's a must-read if you've not heard him address the subject before. "I would not say math is a skill. It requires skills to do it. But it's really a way of knowing/thinking/acting." "Mastery of arithmetic was REALLY important until around 1955. No longer so. Math thinking is important now." Sounds simple, but this is very very deep stuff in my opinion, not easily comprehended by most… and certainly debated by many (as tweets from others often indicate). 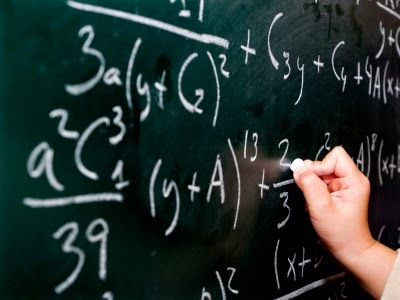 For 40 years I couldn't understand my failure to succeed as a math major in college, having loved math from a young age, and early on professing a desire to be a mathematician (or astrophysicist). I did excellently from primary school through high school (scoring 800 on the math SAT! ), yet hit a brick wall in college. There were some practical reasons involved which I won't cover, but essentially, for decades, I've pondered, with no resolution, why my youthful number talents didn't carry me through. After 40 years of puzzlement, Dr. Devlin's perspective finally offers some clue. Keith has long contended that primary/secondary mathematics is a completely different animal from college-level mathematics, so it isn't that unusual for someone to breeze through the former (which simply require a certain skill set), but get stuck on the latter, which requires a deeper, more abstract understanding. 1) You've written that "mastery of arithmetic was REALLY important until around 1955" but now "math thinking" is what's important. Do you recall when and what brought you to that distinction? And was it an epiphany of sorts for you, or more a gradual change of view over time with evolving technology? Keith: The reality is that what I now deliberately refer to as “mathematical thinking” is what I (and all creative mathematicians) have always understood by “mathematics”. 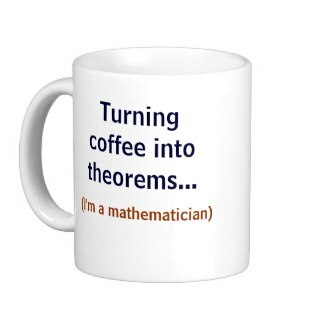 I learned over many years of writing for, and interacting with, non-mathematicians (including my daughters’ mathematics teachers) that many non-mathematicians understood the word to mean something very different. It was probably reading Jo Boaler’s work, which I wrote about in my MAA blog in 2010 (http://www.maa.org/external_archive/devlin/devlin_06_10.html), that finally persuaded me to start using the term “mathematical thinking”. The real meaning of “mathematics” had been lost in the public mind. As Boaler’s research showed, popular impression was that mathematics is a collection of mindLESS techniques, and has nothing to do with reality. My views on just how much mathematics had fallen victim to a “Reality Distortion Field” were driven home for me when I tried to secure NSF funding for a radically different video game concept I had developed (with good video game designers!) that embedded deep and challenging mathematics. We were turned down after one reviewer (that’s all it takes) said there was "not enough mathematical meat” in the game. The first game built on those ideas, Wuzzit Trouble, which the reviewer experienced in prototype form, is now out, built with private investment, and I suspect that reviewer is finding it mathematically challenging. I know of no other game (and I have played many) that requires greater deep mathematical thinking (i.e., “mathematics” problem solving). It just does not fill the screen with symbolic equations. 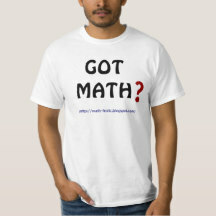 (See http://www.americanscientist.org/issues/pub/the-music-of-math-games for a discussion of the design principles.) And guess what, people love it. After that experience, I finally had to admit that the only possible answer to the provision of good education in this country is by private enterprise. The state system is a century out of date and broken beyond repair. 2) When you first started making this distinction, and new emphasis on "mathematical thinking," did you feel at all like a lone wolf crying in the wilderness? And who would you now point to as other writers/educators worth reading who share/espouse your emphasis? Keith: To some extent maybe I was a lone wolf at the start. But not for long. At the schools level, Dan Meyer came along and shook up the math ed world with one 15 minutes TED talk, and at university level Ed Frenkel has come storming in. None of us is unique in these views, but we have bigger media pulpits than most others who say the same thing. 3) To what degree (if any) is the distinction you're drawing between "skills" and "thinking" applicable to other scientific fields beyond mathematics… physics, biology, chemistry, computer science…? Keith: It applies to all of those fields. The US is not alone, but definitely leads the way, in having an education system that takes learning — something evolution hard-wired into us as an instinctive activity that gives us pleasure (the dopamine fix) — and turns it into a test-driven drudgery. In the 19th Century, when our K-12 education system was being developed, being a well-trained, rule-following drone was the key to lifetime security by way of a job-for-life. Dr. Devlin has an ongoing MOOC course covering all this. I'm sure out of the 1000s who sign up for his course each go-around many MISconceive what the course will be about and drop out disenchanted, so different is "mathematical thinking" from most peoples' idea of math (and Dr. Devlin does explain ahead-of-time what the course will and won't entail) -- p.s. high percentages drop out of most MOOCs. The so-called "New Math" of the 1960s (which I experienced, much to my dismay) was a short-lived failed experiment in math education that most here know about. Sometimes parts of Common Core, or the sort of learning Dr. Devlin encourages, get referred to scornfully as the "new New Math." The original New Math was of course perfectly valid mathematics, but was often critiqued as being inappropriately targeted at youngsters not cognitively ready for it. Of course, cognitive styles, even of young children, may be highly variable -- indeed, I believe they're more variable than perhaps recognized. And once again that seems to be a central issue in the current debates... what are different age groups really prepared for in the way of content? Is it even possible to generalize? Another recent article (via The Atlantic) on the success of Maria Droujkova's "Natural Math" for youngsters, indicates what children are capable of. Perhaps the real problem with most math reforms has less to do with children's abilities, than with a failure to adequately train their teachers in the new approaches. I don't pretend to know...? There's so much more out there on this topic, but I don't wish to drag this post out, so will just leave you with some additional links which offer varying perspectives (...if you've read this far you're likely already aware of most of this! ), but again I'd start with Richard Feynman, because, well, anytime you can begin with Feynman, that ain't a bad way to start! And if you're on Twitter, and interested in these sorts of issues, the #mathed and #mathchat hashtags are sources of ideas/debates from many thoughtful folks.